After two busy weeks, this one feels like a bit of a breather before Madrid and Rome back-to-back. There is a joint event in Oeiras, Portugal (formerly Estoril) which has attracted a strong WTA line-up and a bare looking ATP draw that has just about been saved with Tomas Berdych taking a late wildcard. There is also an ATP event in Munich this week where Fabio Fognini, Tommy Haas, Philipp Kohlschreiber and Gael Monfils are all competing. There will be a set of predictions for Munich available for your laughing pleasure, but here’s the preview for Oeiras. 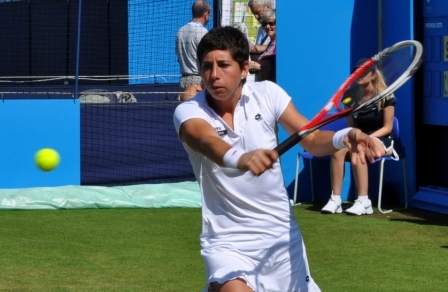 Last year’s finalist, Carla Suarez Navarro is the number one seed in Oerias. The Spaniard produced some excellent performances in Stuttgart last week, beating Ekaterina Makarova and Angelique Kerber in straight sets; however she was forced to pull out of her quarter-final match with Sara Errani with a wrist injury. What is it with tennis wrists this year?! Therefore her participation in the draw remains unlikely. In the top quarter, the finalist in Marrakech, Romina Oprandi could play Suarez Navarro in the second round. There were reports that Oprandi was going to retire after a long injury lay-off, but she is back and has made a rather smooth transition back on the tour. Always looking like a mummy with all her strapping, I’ll be surprised if Oprandi reaches the latter stages of this tournament having played five matches in Morocco. Lucie Safarova is the other seed in the first quarter and she will play Magdalena Rybarikova in the first round. This is a tough match for Lucie as she has a 1-2 head-to-head record with Rybarikova and all their matches have gone three sets. Safarova has been the nearly-woman of this year, coming so close on numerous occasions to taking out a big name. She was a few points away from upsetting the eventual champion in Stuttgart, Maria Sharapova in the first round. I believe she is getting close to putting it all together and this is a really good draw for her to convert her recent good form into results, particularly if CSN is sidelined. The second quarter of the draw is headlined by Sam Stosur and Kaia Kanepi. This is Stosur’s first ever appearance in Oeiras, meanwhile Kanepi has made at least the semi-finals in the last two years and won the event in 2012. Kanepi opens against Yvonne Meusburger, who had some good results on the clay. Last year she won Bad Gastein and made the final in Budapest. Still, my eyes pop out everytime I see she is ranked at number 38. Stosur will take on a qualifer in the first round and should ease into the quarters on a surface she has had much success on. There are some useful players in the third quarter with the likes of Roberta Vinci, Elena Vesnina, Monica Puig and Yanina Wickmayer all in attendance. Puig, who got into the main draw via the long list of withdrawals, opens against Bojana Jovanovski, which is a very winnable match. The winner of that match will play Vesnina in the second round. Wickmayer, who has enjoyed a very up-and-down season with more downs than ups, will fancy her chances of beating Urszula Radwanska in the first round. The younger of the Radwanska sisters came back from injury in February and has lost all five matches she has played on the WTA tour in 2014. The winner of that match is likely to play Vinci in the second round. Eugenie Bouchard bookends the draw and she has it tough, opening with Alisa Kleybanova in the first round. Bouchard took a late wildcard this week and is currently on the entry list for Madrid, Rome AND Nurnberg… too much if you ask me. Her quarter features Svetlana Kuznetsova, who played really well in Stuttgart. If she continues that form, she will win this title. However you cannot overlook the past three years against one good week in Germany because Svetlana has been incredibly erratic, throwing in some shockers along the way. Still, with that in mind, Kuznetsova *should* do well! 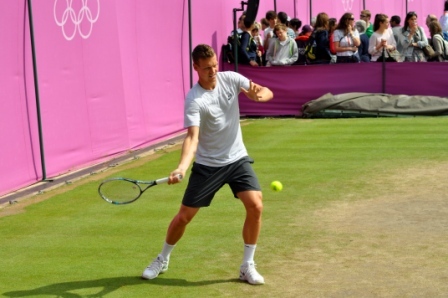 Tomas Berdych has taken a late wildcard into the event and replaces Stanislas Wawrinka at the top of the drawsheet. This is a pretty weak draw for the men, who normally get the centre billing in Portugal as the women get relegated to the outside courts. I hope it’s more even this year, particularly to reflect the quality of the draws. Berdych is projected to meet Joao Sousa in the quarter-finals and then Guillermo Garcia-Lopez in the semi-finals. GGL played some terrific tennis in Monte-Carlo, which included a victory over Berdych in the third round. He has a great draw and should make at leas the semi-finals if can carry on his recent form. Milos Raonic is the stand-out name in the bottom half of the Oeiras draw. He has been drawn in the same quarter as Teymuraz Gabashvili, who is SEEDED. The third quarter features Dmitry Tursunov and Marcel Granollers. Barcelona finalist, Santiago Giraldo is also present, but I do wonder how relevant he will be after an exhausting week. He takes on Albert Montanes in the first round. To be honest, there is not much else to take away from this draw. Sorry, Oeiras.